Tagged under Takashi Takeuchi, Shinjirou, Atsushi Itagaki, TYPE-MOON, Ufotable, Light Novel, Series, Fate. Ultimately, the only things that keep this anime from getting a perfect score is the first three episodes, the anti-climactic ending, and how overall the complexity of the story, while not as mind boggling as Kara no Kyoukai or Evangelion can be, is certainly potent enough to ward away a younger audience. This is especially if they're not entirely used to anime or even somewhat familiar with the Fate franchise as a whole. But other than that, as much as I tried to see if I could find any other discrepancies with my reviewer mindset, I couldn't. The strongest part of the way Fate/Zero was presented to its audience, is it's sense of purpose. Nothing in the anime seems unnecessary or unneeded. with a mature, dark and compelling story Fate/Zero offers a lot of blood, gore, badassness and emotions of all sorts, predating the Fate/Stay Night series with the 4th Holy Grail War. This series is pure awesomeness, from the gripping story to the various characters makes Fate/Zero one hell of a great anime. My favorite heroine in this series is definitely Irisviel von Einzbern, she is truly beautiful and sweet in every way plus she has many layers to her character. The relationship between her and Saber is quite endearing and what she shares with Kiritsugu as his wife is truly amazing. The characters are truly well crafted and I like a majority of the characters (except for that old serpent, Zouken...he's the worst), each has their own unique personality to each their own and philosophy. The best developed character in Zero is Waver Velvet in through his relationship with Rider and how his servant inspired him to achieve great things, also the two are the best Master/Servant pair because of how well they work together. Rin is so cute and I love the episode centered on her, with how it showed that she was courageous even as a little girl. This series is truly deserving of its' popularity and I'm so fond of this series, the best of TYPE-MOON's series they've made. However the only disappointment is the lack of interaction between Kiritsugu and Kirei, I would've liked it if they had more encounters with each other. Overall, I like Zero more than stay night...the story is more engaging in Zero, although Heavens Feel is the best companion piece to Zero. <3 esp lance & archer. The greatest thing about Fate/Zero is its balance. The pacing between the breathtaking and edge-cutting action sequences and the dialogue is really perfect. The animation is the same as you would expect from a movie, but Fate/Zero is also a feast for the ears with a soundtrack from Kajiura Yuki; she really outdid herself with this one, using some instruments and sounds that we aren't used to hear in her works... and this soundtrack is great. Another great quality is that we have a story with many POVs (the masters), and we care for what happens to a lot of them (I, for example, root for Saber & co, but also for Kariya, Waver Velvet, Rider and Lancer). Definitely waiting for the second season! Fate/Zero and Fate/Stay Night are in completely different leagues. All characters are well and adequately developed, with all the Servants' personal history clearly explained. Many of them are really likable. While some of the Masters are certainly mad, none of them is actually STUPID like Emiya Shirou in /Stay Night, which is more than I can appreciate. Still, I find Kotomine Kirei's characterisation a bit queer, and I wish it was better explained through flashbacks just as how Emiya Kiritsugu's character setup is handled. The plot of /Zero is much more satisfactory, with lots of unexpected twists and emotional moments, though it inevitably declines in quality nearing the end because the events have to lead up to those in /Stay Night. It kind of leaves a sour taste, but /Zero itself is not to blame. I particularly enjoy the banquet of the three kings and their debate on what it means to be king. It adds philosophical depths to the story and contributes much to highlighting the characters' differing ideals. The art has improved and is stunning, and the first ED refuses to get out of my head. Not that I want it to. Good anime. Really good anime. I like it a lot more than Fate/Stay Night, that is how the War for the Holy Grail really should look like! the masters are adults, they are smart, use dirty tricks, betray one another to achieve their goals.. some are heartless, some has great ideals. Servants are proud, have strong personalities and fight serious! Plus it's not focused only on Saber this time. The fights themselfs look amazing! whole graphics are superb! The second season is more bloody and violent. Kiritsugu's story is one of the saddest thing I've seen in a long time. A show truly worth everyone's time! I love the character designs. The one-hour long first episode may have only been a lot of preamble for the prequel to Fate, but I just love how it established everything about the Holy Grail War and the characters themselves. Zouken is a complete creep. While Kiritsugu had a bad attitude and view on things including Saber, I hoped over time that would change a little, so he's not so cold but I enjoyed seeing how Saber’s knightly code of honor clashed with Kiritsugu’s assassin mentality. What happened to Sakura was just wrong. It was pretty touching to see Aoi’s childhood friend Kariya do everything in his power to try and save Sakura from such a fate — like a real father would have — even if it meant sacrificing himself in her place though what he did to Aoi was a bit disturbing. Of the Masters, Kariya is undoubtedly the most selfless participant in the Fourth War, which is why I can’t but to felt slightly compassionate about his situation. All it really took was the sight of his bug-infested body to realize the year of hell he went through to learn magic and become a Master, but knowing that he only has a month to live really emphasized just how big of a sacrifice he made. Production quality by ufotable in this one-hour special is top-notch, I didn't consider Fate/Zero having a “slow start” whatsoever, as it was pretty exciting to see the rest of the Masters summon their Servants at the end, backed by an absolutely epic soundtrack by Kaijura Yuki. The Holy Grail War is completely twisted to begin with, seeing how it paired Uryyu with Caster. The Grail itself could probably be seen as the ultimate antagonist though, since a bloodbath ensues from everyone vying for it. Type-Moon have made a habit of finding success with their dark blend of magic and supernatural elements in modern day settings, but with the release of the Fate/Stay Night visual novel on the PC in 2004, the developer seemed to have found its flagship title. Unfortunately things never really work out the way people expect, and while Studio Deen's 2006 anime adaptation of the "Fate" storyline was well received by fans, many who were unfamiliar with the source material found it all a bit ... juvenile. At the end of 2006 the developer began collaborating with Nitroplus in order to create a prequel light novel series, but this time the story was penned by the relatively unknown Urobuchi Gen (with Type-Moon co-founder Takeuchi Takashi providing illustrations). Set ten years before the events in the visual novel, Fate/Zero chronicles the events leading up to and during the fourth Holy Grail War in Fuyuki City, Japan - the same place where the battle will be held in Fate/Stay Night. After three successive failures in the contest, the Einzbern family recruits the notorious mercenary Emiya Kiritsugu, also known as the "Mage Killer" - a man who is willing to use whatever means are necessary to realise his goals. Meanwhile, the other principal magic families - Matou and Tohsaka - are preparing for the coming conflict, and although the church is taking part as well, they have also sent someone to assist the Tohsaka family - Kotomine Kirei. At first glance it may seem as though Fate/Zero is just another action anime, but nothing could be further from the truth. The series has a very different tone than either Fate/Stay Night or Unlimited Blade Works, and in many ways it has more in common with the dark, brooding atmosphere of the Kara no Kyoukai movies. That said, the series does assume that the viewer has some familiarity with the franchise, but this is balanced by a much tighter plot than that of either of its predecessors, and more focus on preparation, planning, and even dialogue between the different parties. The result is that the narrative has far more depth and structure than one might expect in a supernatural action anime, and there are layers of subtext that are gradually added as the series progresses. One of the most noticeable aspects of Fate/Zero is that it's a far more mature story than the original visual novel or its adaptations, and unlike many other shows, there are very few occasions where the characters engage in pointless conflicts or endeavours. The series carefully tries to avoid insulting the viewer's intelligence by adopting a patient, methodical build-up to the action set pieces, and on many occasions the story focuses on information gathering and planning. In addition to this, the battle lines shift constantly as the combatants form short-term alliances in order to counter the moves of other opponents, but there's always the understanding that the foundation of these is nothing more than "the enemy of my enemy". In truth, this anime has far better examples of tactics and strategy than anything found in Code Geass, and certain plots are Machiavellian enough to give Death Note a run for its money. When it comes to production values, Fate/Zero could be considered the final evolution of everything Type-Moon and Ufotable have learned from each other during their long collaboration on the Kara no Kyoukai franchise. The series looks every bit as good as one might expect, and the darker colour palette is offset by the high standard of animation. That said, although the action sequences are fluid and very well choreographed, the real testament to the quality of Ufotable's work are the subtle differences in the way the characters move. While there are plenty of new faces in this prequel, it's actually the design of recurring characters like Sabre that really sets the standard. Fate/Stay Night's popularity turned her into one of the most iconic female leads in anime, but while she may appear to be exactly the same in Fate/Zero, there's an edge to her features and a preciseness to her movements that was missing in the original series. This fact is also true for the characters that are unique to this show, and even Tohsaka Rin's "adventure" has been given the same level of care and attention to detail. The series opens with a well choreographed sequence that blends action with a montage of the main participants in the Holy Grail War, all set to the rather pacey rock song "Oath Sign" by LiSA. Each episode closes with "Memoria" by Eir Aoi, a bittersweet rock ballad that fits well with the images of the heroic spirits as pieces on a game board and at moments in their own history. Fate/Zero also has one of the most diverse scores in a 13 episode anime, with martial themes, operatic pieces, strange little tunes with drums or pianos as the major instrument, and more besides. The audio effects or of a very high quality, and the clash of steel on steel is as sharp and clear as the sound of the lightning whenever Rider makes a dramatic appearance. One of the areas where Fate/Zero excels is the dialogue, and while there are occasions where conversations go on a bit too long, the script is intelligently written, rational, and insightful. One of the best examples of this is Rider's discourse on the true nature of kingship and Saber's reaction to it, but even that is nothing more than words on paper as everything lies in the delivery - so it's a good thing that the acting is of a high standard. Kawasumi Ayako reprises her role as the King of Knights (Saber/Arturia) from Fate/Stay Night and Unlimited Blade Works, but her performance here is markedly different. Her portrayal of Saber is colder, deadlier, and far more focused than before, while Tomokazu Seki's performance as the King of Heroes (Archer/Gilgamesh), is more arrogant, more proud. That said, it's Ootsuka Akio in the role of the King of Conquerors (Rider/Iskander), who really steals the show, and his testosterone-fuelled proclamations and battle-born wisdom are one of the pillars that support the series. When it comes to development, a large group of characters often means that some will undoubtedly fall by the wayside. Fate/Zero neatly sidesteps the entire issue of development because it's first and foremost a prequel of an existing story, but in addition to this the series has created a set of individuals who leave extremely strong impressions on the viewer, and much like Baccano!, there is a distinct lack of a true main character. Because of these factors the series can focus on showing how each of the combatants became what they are, and this plays a major part in one's enjoyment of the anime. The emphasis on characterisation rather than development allows for a remarkable degree of definition, and although it's ultimately the personalities of each individual that captures the viewer's attention, standing at the top of them all is the King of Conquerors - Rider. His addition to the franchise has been nothing short of a revelation, and while die-hard fans will continue to worship the ground that Saber and Archer (not Gilgamesh, the other one), walk on, Rider's enjoyment of life, his exuberance and almost boyish eagerness for battle and glory, have captured the imaginations of many fans. In many respects he, more than any other character, is the epitome of the heroes of old, but simply having a bunch of overzealous combat junkies beating each other to a pulp isn't really entertainment (unless you have an IQ equal to your shoe size), so there has to be something to balance it - and there is. Each of the mages taking part in the Holy Grail War is more like a chessmaster, planning as many moves ahead as possible, whilst preparing themselves for anything their opponents may try. The simple fact is that Fate/Zero wouldn't work as either a story or entertainment if it was just the mages or the heroes, and it's this aspect of the series that separates it from not just its predecessors, but also many other action anime out there. Unfortunately it's not all sweetness and light. One of the main criticisms of this series is the episode about the young Tohsaka Rin, which many people found unnecessary. Now although there's some truth to that perception, one could also have the opinion that Rin's actions tie-in to an event in the previous episode, and together they lead up to the end of the series. Both are fair arguments, but in all honesty the whole thing doesn't really fit with the rest of the anime, and it seems like nothing more than an attempt to allow Matou Kariya some long overdue screen-time. Fate/Zero isn't a perfect show, but while it does have several minor issues (and one "filler" episode), it does exactly what it sets out to do - capture the attention of the audience and make them want more. The story is intelligent, and while conversations and discussions can sometimes feel a little tedious, the dialogue is often quite interesting - moreso than the show's predecessor's anyway. Although the series can boast stylish, fast-aced action set-pieces, it also studiously avoids combat for the sake of gratuitous violence. That said, Fate/Zero is still a prequel series, and at this point only half of the story has been told. 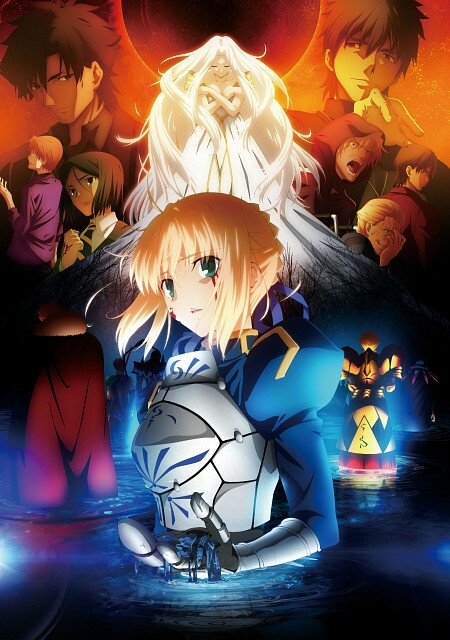 Unfortunately the anime industry has a habit of messing things up, but given the quality of this show, the fact that the original story was written by Urobuchi Gen, and the knowledge that the series is being produced by Type-Moon's long time collaborators - Ufotable, fans can be cautiously optimistic about the second installment. Good anime, I really love the univers, the quality of the anime, the scenario and characters. But I don't really like the ost for the moment, and some faces expressions... Too exagered. And doing 2 seasons for 25 episodes was not necessary. Can't wait for the second season, it's the better part of the story ! The best anime of the 2nd quarter of 2011. It is epic and blows Fate/Stay Night out of the water. My favorite servants are now Saber, Lancer & Rider! Rider is so FUNNY! And loveable, how can you not love him.